On the Peak Tone 7 we reach the top of the pyramid to complete a new Human effort of Spiritual Growth. Tone 7 encourages Reflection to see all that is, and all that is not. Tone 7 helps us to see the Truth of where we are and the effort we’ve invested to change our Self. In the last trecena of Transformer/CIMI, we were given a Sign of a Major Life Change in our future. CIMI was a cycle of “darkness” (application) where we learned the realities of change. We learned that something would die so that something new could be born. We were guided to see that we would experience some chaos in the process of a Transition from one state of consciousness to another. To change our mind (transformation), the beliefs that motivate our behavior are stirred up so we can “clearly see” what needs to die for something new to be born. Serpent/CHICCHAN is a catalyst that lights the fuse of Spirit. CHICCHAN is the Day Sign of “lightning in the blood,” the Life Force that empowers all our supernatural gifts of Knowing. CHICCHAN can help us clearly see the Truth of our Spirit. Revealing our Deeper Truths, CHICCHAN’s gift of Knowing can turn us in a direction called by Spirit. Portal Days thin the veil to the dimension of Spirit and magnify our Spiritual Gifts of Knowing. 7 Serpent/CHICCHAN establishes a Balance of Spiritual Power between the Above and the Below. A Portal will magnify our Consciousness of CHICCHAN’s Gift as a catalyst for a Major Life Change of Spirit. Like a Storm, this cycle has led us to some unexpected changes. Residing in our Center our focus is directed outward. We see the landscape of our life reflecting the chaos of change. We’ve been exposed to life and death issues that impact the safety and security of “home.” In order to affect a Renewal and Regeneration, our eyes must be opened to see how our own state of mind contributed to the circumstances up for change. I expected Storm to be an easier climb. Instead, it’s been a journey through “darkness that resists the Light.” I can’t imagine any darkness greater than the circumstances that have put so many children at risk, a darkness bound to tear home and family apart. In an effort of Reflection, I searched for deeper meanings of CAUAC and the planetary influences reflected by the Haab “vague year” 365-day calendar, Earth’s cycle of transformation. 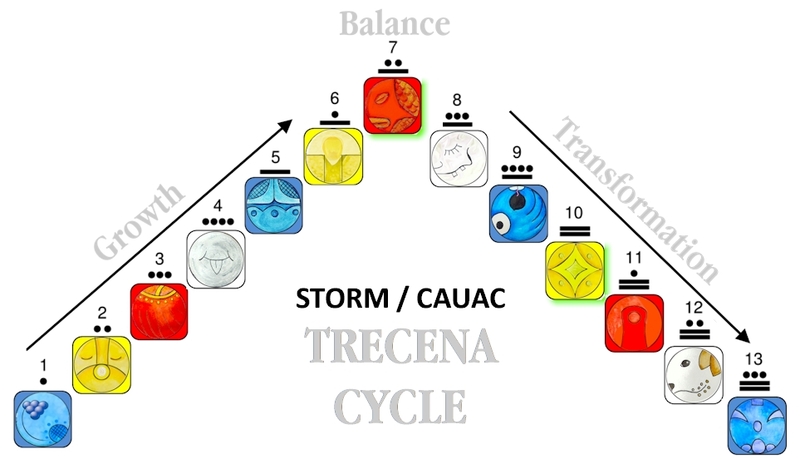 The Storm/CAUAC trecena is a cycle of Renewal and Regeneration. Resources from the Tzolk’in Explorer, define CAUAC as a catalyst of change. Like CHICCHAN is a catalyst that “lights a fuse” of Spirit within, CAUAC stirs up the chaos outside of our Self to affect a change within. Some illusions and fears are harder to dispel than others. The definition of CAUAC from the above linked resource notes that sometimes it takes the disruption of a Storm to sweep the unwanted away from our life. CAUAC can serve as a catalyst by stirring things up than demand change. Some heed Storm/CAUAC as a warning of a cycle holding the potential for a major disruption, one we didn’t expect, and one we’re unlikely to forget. The Haab calendar represents planetary cycles, and can offer a perspective of what is going on in the world around us, the outer experiences that frame our Intention of Spirit. The current Year Bearer is 6 Deer/MANIK. This bearer of time for this Haab year, is a call to serve in the role of the Mayan priest, the One who draws on the Higher Authority of Spirit to Guide and Protect the people. Planetary influences are calling us to a Divine Humanitarian effort. Today’s Haab date is 18 Sotz/Zotz. (The 18 of the 19 months of the Haab are 20-days in length, and the final month is 5 days, the Wayeb. 20-day months are numbered 0-19.) Sotz, the 4th month of the Haab, is unique as it represents two totems, the bat and the fish, connecting the Elements of Air and Water. Sotz is a symbol of a Spiritual Gift that connects our mind and emotions. What these two totems share in common is the “internal radar” they use for navigating their realms of darkness. The bat and the fish navigate by an inner Sense of Vibration. Sotz’ traditions also relate to Bees and Beekeeping. So do bees rely on an invisible path of navigation. Planetary influences are demanding that we navigate through the darkness by an inner sense of Knowing. CHICCHAN’s gift of lightning to our Spirit can open our eyes of Divine Discernment. As the Day Sign that lights the fuse, we can see a Divine Synchronicity in the Timing, the Meaning, and the Purpose we are “charged” to carry out. We’re charged to sit up and take notice of what is going on. Clearly seeing the Truth, we’ll be motivated to do what must be done. Charged to be the Deer, our vigilant observation of the landscape will bring a clear discernment for a direction of movement. There’s good news and bad news. In order to manifest the change, we must see that we were part of the problem. We can see our part through our own way of movement. The CIMI trecena raised us to an Understanding of the principles of movement. On 12 Earth/CABAN, we learned that the “passive principle” and the “active principle” are both ways of movement. Ollin, the Aztec sign of Movement, warns of the potential for negative consequences when we do nothing, when we passively go along with the movement of the world around us. The gift of Free Will means the only thing we hold the Divine Authority to change is our Self. Blaming others is a waste of time. We can’t wait idly by for others to change, we have to discern what we can change in our Self to effect a Renewal and Regeneration of Spirit. It’s easy to look at the world outside of our self and feel powerless. Though, there ARE things that we can do. CHICCHAN can open our eyes to a way we can help right now. We could see a direction we could to take to help one person in the realm of our influence. Helping One helps the Whole. CHICCHAN can help us Know at least one way to serve the well-being of Humanity. My discernment of direction was to sign up with monthly support to the American Civil Liberties Union (ACLU). My voice doesn’t carry far on its own, but I can support an organization respected for being a Voice for Humanity. I can hold Faith in a movement of Spiritual Intention, no matter how small and futile the offering might appear by a worldly valuation. The darkness that I see in myself is inaction. Stories of children suffering in the world aren’t new. It took stories that were closer to home for me to become fully conscious of the greatness of the need. I held a greater sense of powerlessness when it was happening far away. Our service to Humanity requires us to see that ALL of us are One. We can serve the broken-hearts of Humanity no matter where they are. Distance is only an illusion of separation. The good news is that we are guided by a Divine Creator that intends for Humanity to know the Peace and Happiness of Divine Justice. A power greater than our self is leading the charge of the Divine Transformation of Humanity. Both the Tzolk’in and the Haab reflect a threshold of Major Life Change. CIMI returns tomorrow in the Position of Divine Justice and “Pure Spirit” on the Holy Tone 8. 8 Transformer/CIMI is an Exalted Sign of Change. The Haab also reflects that major change is drawing near. In two days, the Haab moves to the month of Sek/Tzec, illustrated as the glyph of Death. Sek is correspondent with CIMI’s Sign of Major Life Change, though on a planetary scale. We can hold hope as all signs point to major changes – one tomorrow on 8 CIMI, and another on 9 Deer/MANIK. 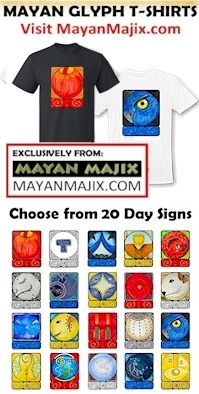 9 MANIK, the Kin that completes our Transformation as the Mayan priest, corresponds with 0 Sek/Tzec, the Haab month that begins a 20-day cycle of major planetary change (June 20). Storm/CAUAC has drawn us to the place of comfort within that is symbolized as “Home.” Our Awareness has been drawn to Human’s fundamental need of Home, Family, and Community to manifest Love and Happiness. Our eyes have been drawn to see that “Home” must be demanded as a fundamental Human Right of Happiness. I feel I’ve been forced to bring up topics I’ve tried to avoid for fear of upsetting those who may perceive worldly events differently than I do. In my realm of influence, subjects we used to discuss are now taboo. We’re so divided we’ve become afraid to speak of it with one another. Today, I feel I have no other choice than to call on You to find Your own way to help. One innocent child torn from the arms of its mother and family is one child too many for me to give up on anymore. The images of their tears has broken my heart. And, we haven’t even seen the suffering that lies hidden behind closed doors that would reveal the depth of their suffering. What child could find any comfort, facing the fear they may never see their family again? Tone 7 is the Balancing Place. The Divine Intention we’ve held in our Consciousness will be balanced in every realm of our existence. Tone 7 fulfills the Spiritual Law of “As Above, So Below.” We can effect change in every realm of our existence. We can choose the realm that draws from the resources we have to offer. What we may have little power to influence in the realm of the physical, we can change from the realm of Spirit. Where we lack faith in Spirit, we can weld the power we hold on Earth. Like my balcony garden, I created it for a meaning and purpose of Spirit. As I see the flowers bloom there, and the new lives being created by the birds, I can claim it as a garden that will manifest Beauty and Life in the realm of Spirit. To all my relations, may we see that there is ALWAYS something we can do to transform the Darkness into Light. Each one of us is perfectly positioned with the Gift that we are meant to bring. If Faith and Hope is all we have to offer, God will use a movement in Spirit to effect a change on Earth. If we have something to give in the realm of the physical, God will use it to influence the realm of Spirit. The gifts that each of us can bring are Equally Important to a Divine Cause. May CHICCHAN wake us up to the Truth that we are One, no matter where in the world we are. May we contribute our own Movement to a Divine Intention of Renewal and Regeneration that would touch EVERY Human heart. May we believe in whatever Power we hold to make a difference. No matter how small our effort may look, may we KNOW Deep Within our Soul, that a Movement of Divine Intention WILL make a difference. May we see that we have been presented with a Meaning and Purpose, along with the Spiritual Senses to Know our own way to serve and protect the Whole. Like the Deer, may we be the Divine Protector of the Holy Ground we know as Home. May we believe in the Creator’s Intention to Regenerate our Spirit through a Miracle of Power exchanged between the Above and the Below. May we Know the Truth of the Power of our Love to manifest a Miracle. I’m grateful for a promise of Divine Justice that will Heal the Hearts of the Whole.